October 25 marks the birthday of jazz guitar great Eddie Lang, who was born on that day in 1902. Eddie Lang was born as Salvatore Massaro in Philedelphia, Pennsylvania. He initially took up violin, playing with his close school friend Joe Venuti, and later switched to guitar. In the 1920s, Lang played in various bands and with such luminaries as Frankie Trumbauer, Bix Beiderbecke, Adrian Rollini, and Lonnie Johnson, the latter of whom he recorded with under the name “Blind Willie Dunn”. Tragically, Eddie Lang died in 1933 at the age of 30 as the result of a botched tonsillectomy. Okeh 8696 was recorded on May 22, 1929 in New York City, and issued in their race series for some reason. The band includes the talent of Tommy Dorsey on trumpet, Jimmy Dorsey on clarinet and alto sax, Arthur Schutt on piano, Eddie Lang on guitar, Joe Tarto on string bass, and Stan King on drums. This record isn’t in the greatest condition, but I think it’s a great choice to celebrate Eddie’s birthday. First, the band plays “Freeze an’ Melt”, a Dorothy Fields and Jimmy McHugh composition. 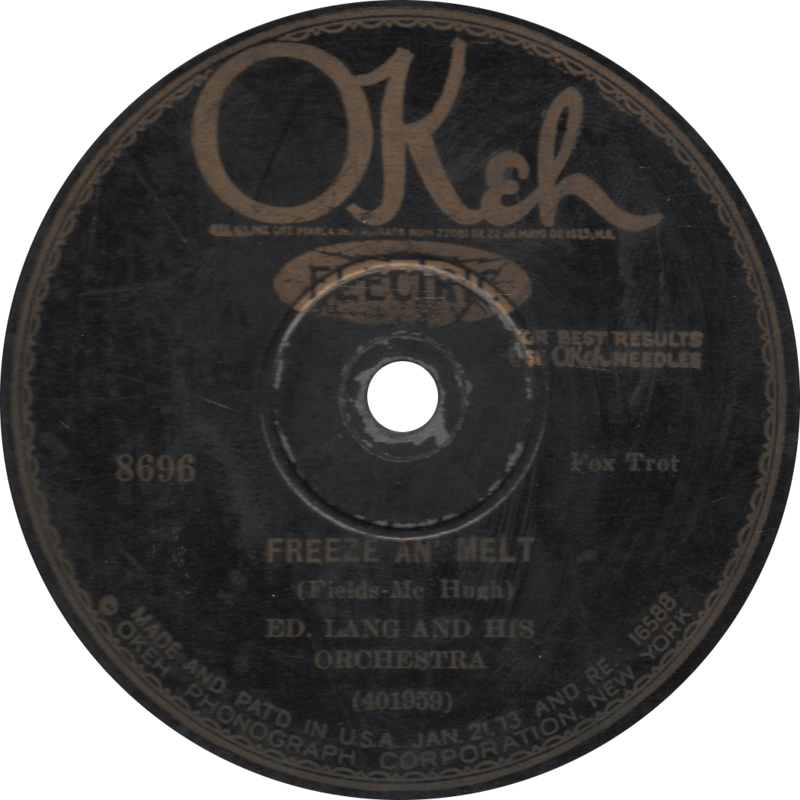 Freeze an’ Melt, recorded May 22, 1929 by Ed. Lang and his Orchestra. 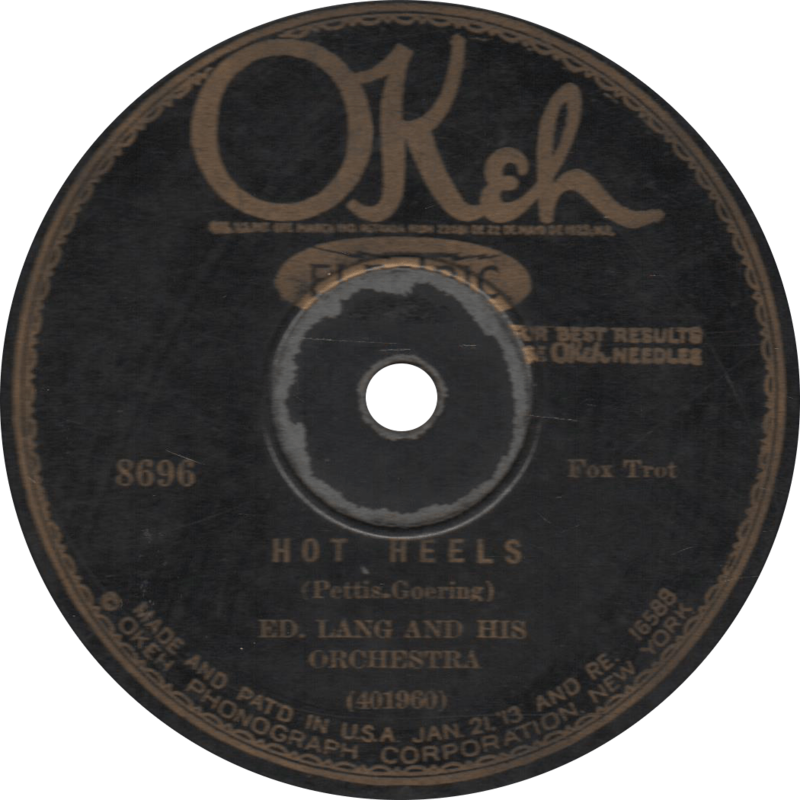 Eddie Lang takes a nice long solo on “Hot Heels”, composed by Jack Pettis and Al Goering. Hot Heels, recorded May 22, 1929 by Ed. Lang and his Orchestra. This entry was posted in Records and tagged 1920s, 1929, Al Goering, Arthur Schutt, Dorothy Fields, Eddie Lang, Jack Pettis, Jazz, Jimmy Dorsey, Jimmy McHugh, Joe Tarto, New York, Okeh, Race Record, Stan King, Tommy Dorsey by R. Connor Montgomery. Bookmark the permalink.